The convenience store clerk was alone when a man entered the store. He demanded money and cigarettes. When the clerk refused, the clerk was beaten and then shot, leaving no eyewitnesses to this horrific crime. But there was a ‘witness’ – the store had a single security camera. The suspect’s face was not clear in the video, but he was imaged walking behind the cash desk and around the store. What next? The forensic specialist needed to extract some key measurements from the security video, such as the suspect’s height, some measurements on his clothing, and where he stood in the store at various times during the incident. How can these measurement be made from a single camera? Photogrammetry is the science of extracting measurements from photographs. Normally photogrammetry is carried out with multiple photographs taken from different positions. Sometimes it is difficult to extract data from single images. In this paper, ‘Extracting Accurate Measurements from Single Surveillance Camera Images’, by Eugene Liscio of ai2-3D Forensics, a detailed method is described using PhotoModeler to ‘marry’ the detail of a 3D laser scan with one still from a security camera, and then exported to 3D Studio Max for further analysis. In the paper Mr. Liscio simulated a scene due to the sensitive nature of the real forensic cases he works with, but the techniques described apply to real cases as well. PhotoModeler had a recent update (version 2017.0 / Apr 10, 2017) that included a useful new capability that improves accuracy in these projects. 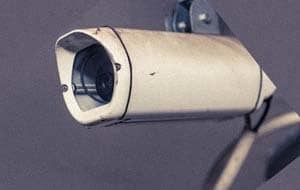 Many security and surveillance cameras have wide angle lenses to maximize what they ‘see’. These wide angle lenses have significant lens distortion (straight lines are no longer straight). To obtain accurate measurements you need to correct for this lens distortion. PhotoModeler has always had lens distortion correction, but starting in the 2017.0 release, this correction can now be done in a single photo project as well. The Combining LIDAR (Laser scan) data with photogrammetry video is also a good resource on this topic. The paper goes into detail of the steps and process. Here are the rough steps. Grab video from security camera’s storage & get key frames. Use a laser scanner to produce a detailed 3d point cloud of the store as it exists today. Extract key 3D points from the laser scan data that match the scene as it was at the time of the crime (that is, if something has moved between the crime date and the date of the scan, don’t use that). Use PhotoModeler to mark these key ‘control points’ on the imported security footage. In PhotoModeler solve for the security camera position and internal parameters (including lens distortion). Lastly, either perform some plane-based measurements in PhotoModeler, or as the paper does, create an idealized version of the security footage and export to 3D Studio Max for matching and further analysis. 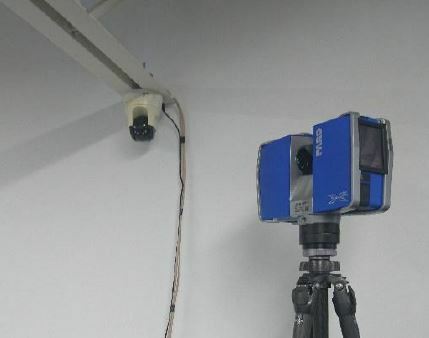 In addition to the above referenced paper on the use of a laser scanner with a security camera, we published an article previously discussing the extraction of measurements and 3D data from a Dropcam camera used as a security camera in a small shop. If you have any questions on how to use PhotoModeler in these types of forensic cases please contact us at sales@photomodeler.com.